Criterion box set of three Wallace Shawn and Andre Gregory films, including My Dinner With Andre, reviewed. Three remarkable films, separated by more than 30 years, constructed by the odd, patient duo of Wallace Shawn and André Gregory. Wallace Shawn and André Gregory in My Dinner With André. It’s difficult to imagine a more unlikely candidate for iconic film status than My Dinner With André. 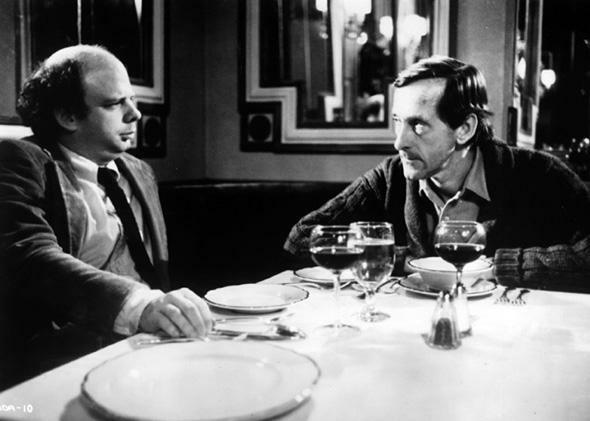 Louis Malle’s 1981 film is absurdly low-concept: A grumpy, underemployed playwright/actor named Wally (Wallace Shawn) grudgingly goes to dinner with his longtime friend and colleague André (André Gregory), a theater director who is going through some sort of existential crisis. Over an hour and 45 minutes at an upscale Manhattan restaurant, the two discuss André’s world travels, his extreme experiments in theater, his spiritual nervous breakdown, and both men’s alienation from modern life. Neither man leaves his chair. Indeed, they barely touch their food. The film never introduces flashback scenes to reveal their backstories or motivations. Neither man’s life is at stake. Neither one reveals an Earth-shaking secret. No pretense is made that either man arrives at a life-changing epiphany. Nearly every shot is a close-up of one of two barely-known-outside-New-York avant-garde theater artists talking or listening. Even in 1981 it must have seemed odd; by the standards of our own spectacle-driven cinematic era, My Dinner With André looks like an act of perversity, a prank. And yet this prank went on to become a surprise art-house success and a cultural touchstone of such longevity that it has inspired parodies and tributes on Frasier, Touched By An Angel , The Simpsons, Community, and Family Guy; an entire hour-long parody film from Andy Kaufman; action figures; and now a place of pride in a new Criterion box set alongside the other two cinematic collaborations between the men behind André and Wally, Vanya on 42nd Street and A Master Builder. The idea that two later films, spiritual sequels in a way to My Dinner With André, would even be made would certainly have surprised Gregory and Shawn; no one involved could have thought the project was destined for anything other than obscurity. Shawn, a downtown playwright and actor, had the idea of dramatizing his many conversations with his friend Gregory, so he massively condensed and reworded transcripts of several of their meetings into a script that found its way into the hands of the filmmaker Louis Malle, who’d found acclaim with taboo-bursting features both in his native France (Murmur of the Heart) and in Hollywood (Pretty Baby, Atlantic City). Perhaps world traveler Malle (who chronicled life all over India for two documentaries in the late sixties) saw something of himself in Gregory’s searching journeys, or perhaps he was seeking an entirely new challenge for his already quite diverse filmography, but the result was an extraordinary creative alchemy among three already very distinctive artistic voices. My Dinner With André is deceptive on several levels. While it appears to take the form of an arc-less, meandering conversation between friends, there’s actually a muted but muscular structure underneath. If you’re not already a devotee of certain kinds of theatrical mysticism popular in the 1960s and ’70s, the first 80 minutes of My Dinner With André can be kind of a tough go, as André recounts his globe-spanning peregrinations and strange, sometimes frightening communal theater exercises in remote locations. It’s hard to get a bead on what the film thinks of André: Is he a fearless adventurer? Is he a disturbed adrenaline junkie? Is he a pretentious twit? And because Wally is reduced to saying almost nothing other than “My God! Well then what happened?” the film is essentially ceded to André for much of its running time. This can be an alienating experience for a viewer who, like me, feels a bit conflicted about André’s extreme ideas (including comparing himself to Albert Speer in a moment of overblown self-loathing). The payoff of Wally’s mini-revolt is all the more potent because it’s delayed for so long. It brings not only welcome levity into the film, but also opens up My Dinner’s spectrum of concerns. Most viewers probably feel like Wally; most of us would rather not give up whatever our equivalent of the electric blanket is. (Rather delightfully, Gregory reveals on the DVD extras that he was often wearing an electric blanket over his legs during the filming of André.) Suddenly giving us a voice in this dinner conversation fills the movie with fresh oxygen. When near the film’s end the two friends find something of a common middle ground as baffled strangers in the emotionally repressed world of early-’80s America, it’s a genuinely warm moment of connection. Perhaps My Dinner With André’s deepest deception lies in hiding a subtle film inside an apparently very unsubtle one. No one would call André and Wally’s conversation understated; they spell out their concerns at great (and in Wally’s case spluttering) length, but Malle surrounds them with a muted, unobtrusive environment that gently comments on and contextualizes their conversation. Even as André describes his habit of referring to his elevator operator by his first name as “an act of murder,” Malle gently captures the way in which he barely even looks at their waiter (the fascinatingly visaged Jean Lenauer). He’s acknowledged his behavior, we realize, but will he ever actually change it? It’s pleasing to learn from interviews on the Criterion extras that this is all deliberate; at an early stage of development Shawn had wanted Wally and André to do a walk-and-talk past people digging a ditch, and André refers to two of his character’s modes in the film as “dilettante rich kid” and “spiritual used-car salesman.” Shawn and Gregory know perfectly well how their fictionalized alter egos are coming off, and Malle’s low-key direction quietly but piercingly comments from the sidelines. And if Gregory’s description of his own theatrical excesses seemed buffoonish in My Dinner, 1995’s majestic Vanya on 42nd Street—in part a product of his cut-no-corners philosophy—will make you forgive him in an instant. I’ll admit my bias up front: I’m a theater-maker, and a film that celebrates theater is likely to be an easy sell for me, but even adjusting for that predisposition, Vanya on 42nd Street is enrapturing. For four years, Gregory had been work-shopping a production of Anton Chekhov’s Uncle Vanya with an all-star group of actors (among them Julianne Moore and The Silence of the Lambs’ Brooke Smith), occasionally inviting an audience of friends to a run-through in the then-abandoned, decaying New Amsterdam Theater on 42nd Street in New York City. For the last film before his death, Malle reunited with Gregoy and Shawn to re-enact one of those run-throughs on film. Malle’s understated masterstroke in Vanya is to just admit the play is a play; that the actors aren’t really the characters—and then make you care about the story anyway. We meet the cast (most amusingly Shawn, grumpily munching a knish) on 42nd Street as they amble into rehearsal. (The looks we get at the theater and its environs serve as a farewell to the old Times Square and a theatrical economy that could support this kind of odd experiment in Midtown; by 1997, the New Amsterdam would be locked up in a 99-year lease by Disney and running The Lion King every night.) As the cast and director Gregory greet the friends who’ve come to see the run-through, Malle picks up bits of pre-rehearsal conversations on the fly, until we’re startled to realize that one of these exchanges is actually the first scene of Uncle Vanya. When the play reaches intermission, Malle shows the actors—briefly out of character—enjoying a few snacks with the small audience before resuming the play. No attempt is made to hide the 20th-century reality of the rehearsal; the actors are in contemporary dress, and in a late confrontation scene Shawn’s Vanya blithely drinks from an “I ♥ NY” cup. And yet none of this blunts the play’s impact. Gregory’s multi-year rehearsal process allows the actors to gorgeously inhabit Chekhov’s mordantly morose country aristocrats. That first scene, evolving organically out of a conversation, presages an entire production in which it often feels like we’re eavesdropping instead of watching a play. (The spare translation is by David Mamet.) It’s hard to pick a highlight out of such a stellar cast (including Shawn’s hilariously despairing take on Vanya), but Brooke Smith’s lovelorn, desperately hopeful portrayal of Sonya cuts so close to the bone it’s often difficult to watch, and her closing monologue is transfixing. Malle and director of photography Declan Quinn capture all the action in carefully composed medium shots and close-ups that never draw attention to their own elegance. The film simultaneously honors the bleak beauty of Chekhov’s play and the oddly heartwarming phenomenon of a group of artists sharing a sad story with friends. Indeed, for all its melancholy, Vanya on 42nd Street functions as a happy coda to My Dinner With André, a production that suggests that the alienated men of the earlier movie finally found a way to powerfully connect with others, both fellow artists and audiences. Four years to rehearse Uncle Vanya might sound like a lot, but that’s nothing compared to the 14 Gregory spent rehearsing Shawn’s adaptation of Henrik Ibsen’s odd-duck tragedy The Master Builder. Jonathan Demme’s film of the production (if “production” is even the right word for Gregory’s elongated, in-house dramatic projects), titled A Master Builder, is definitely the odd man out in this trilogy of films. Demme doesn’t even remotely attempt to imitate Malle’s style, replacing his predecessor’s dark, eloquently static compositions with cameras swooping through rooms flooded with sunlight. There’s no pretense that we’re watching a conversation or a piece of live theater. A Master Builder is clearly a film from frame one as the camera tracks past elegantly appointed houses presumably designed by our titular hero. And the startling, Owl Creek Bridge–like take on Ibsen’s ending (which, as Shawn and Gregory reveal in a DVD extra interview, they only thought of in the 14th year of working on the play) is clearly conceived with cinema’s ability to cross-cut quickly between two realities in mind. The big surprise of A Master Builder’s cast (which also features superb turns by Julie Hagerty and Lisa Joyce) is Shawn himself, taking on and triumphing in the atypical (for him) role of Master Builder Solness. And it’s here that A Master Builder brings many themes both in the Gregory-Shawn collaboration and in Shawn’s own work to a head. Wallace Shawn’s writing has repeatedly returned to the idea of a stand-in character (often played by Shawn) chafing against an ambivalent relationship with a distinguished older man. Shawn has acknowledged in essays that he was intimidated by his legendary father (New Yorker editor William Shawn), and his narrator in The Designated Mourner toxically envies his girlfriend’s eminent intellectual father. This theme runs throughout the Shawn-Gregory film trilogy as well, from Wally’s mini-revolt against André in the first film to his Vanya’s flailing attack on Serybryakov in the second. But here, in A Master Builder (just as in Shawn’s most recent stage play, Grasses of a Thousand Colors), Shawn himself portrays the elder statesman, the venerated older man who is in turn himself resented by younger people. It’s a fascinating new perspective for Shawn, both as a writer and as an actor. With his diminutive stature and widely imitated lisp (Shawn’s celebrated delivery of a single word is far more famous than anything in the three films in this Criterion box set), Shawn has made a career out of playing underdogs or, at best, ineffectual little men grasping at power. But he effortlessly turns those same traits into totems of true power in A Master Builder as a feared architect with many people’s careers and lives at his command. He sells the May-December love story in the same way. It’s easy to sneer at the idea of Joyce’s gorgeous young Hilda gazing with dazzled admiration at a guy who looks like Wallace Shawn. But on the other hand, that’s how I look at Shawn when I occasionally run across him at an event in New York. Why wouldn’t I? Shawn has spent decades since My Dinner With André accumulating high- and low-culture cachet; he’s the genius who wrote Aunt Dan & Lemon and the voice of the T. rex in Toy Story. According to the extras, it was Gregory’s idea that Shawn adapt and play The Master Builder; perhaps this longtime collaborator knew it was time for Shawn to begin investigating his inner Solness? A Master Builder is a good film in and of itself, but it’s perhaps a bit of a letdown when considered in the context of the Shawn-Gregory trilogy. Malle’s two Gregory/Shawn works find moments of thrilling intersection between the theatrical and the cinematic (the shot of the waiter’s startled reaction to André’s laughter in My Dinner, Julianne Moore’s surprise voice-over in Vanya), and both offer moments where we seem to be welcomed into Gregory and Shawn’s world and process. By committing to its cinematic reality right off the bat, A Master Builder relinquishes any attempt at such moments, and we miss the sense that this is in part a document of a crazy project lovingly crafted by a small group of artists. Thirty-plus years ago we watched them eat dinner; 20 years ago we saw them put on a show; in this third film of a most unlikely and exceptional trilogy, we miss getting to check in with our friends.